In the spirit of using things up, I dashed out this simple shawl on the ski trip bus. 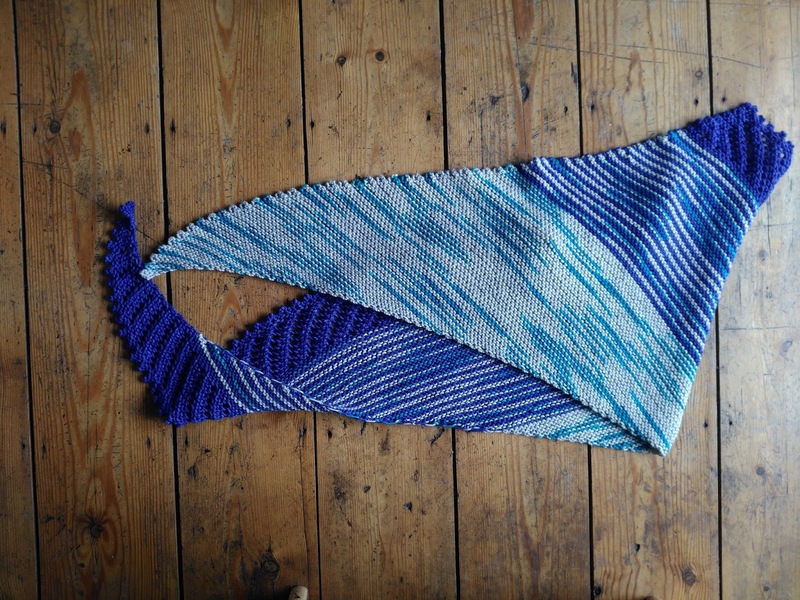 It was Kat from Knatterers' suggestion that I use up this lovely variegated Madelinetosh by pairing it with something and making a striped shawl, a la Zephyr Cove. In the end I plumped for this pattern, mainly because it was cheaper. Mods: I didn't knit the same number of repeats: I had to be pragmatic as I was limited on yarn; also, this pattern is written for 4-ply yarn. 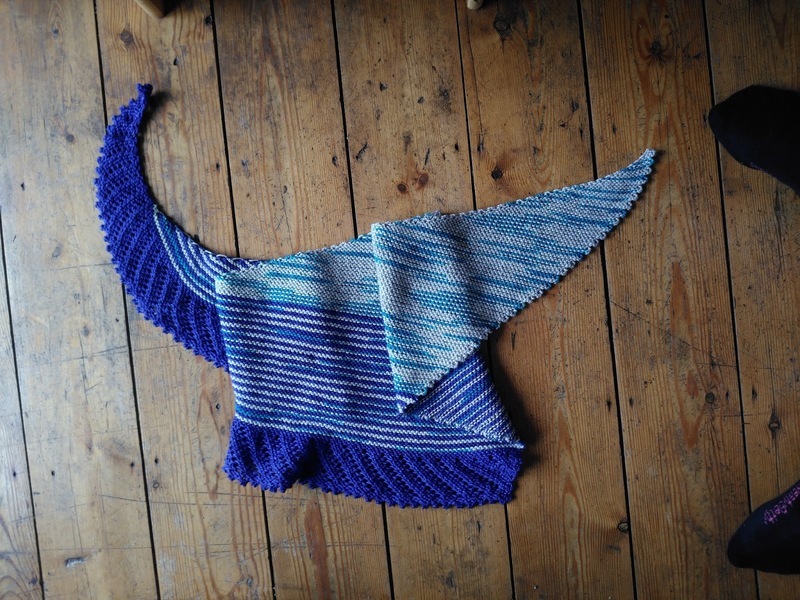 I worked 34 picots in the main colour, which was roughly equivalent to the pattern for my row gauge; 16 stripes in the contrast colour (until I ran out of the MC); 10 eyelet rows on the border, finishing with just 2 rows even, as I was concerned about having enough yarn to bind off. 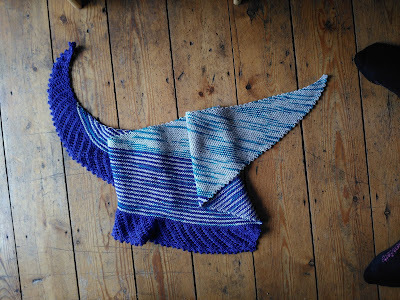 The finished piece was 65 inches across and 17 inches at the longest part, before blocking. It's currently hanging on the line after a good soaking and I am guessing it will dry considerably longer. The blue skein ran quite a lot in the wash and I think it might have stained the grey a little; I'm actually hoping that is the case because I think that will only improve the way the colours blend. Bonus feet in that one. I wasn't sure about the colours together when I started the striping but now it is finished, I am very pleased with it. I was hoping for something that resembled the deepening blue of Lake Tahoe, which is going to be forever associated with this yarn on account of when and where I bought it. I think I have gone some way towards achieving it. Also, it is very squishy and lovely.